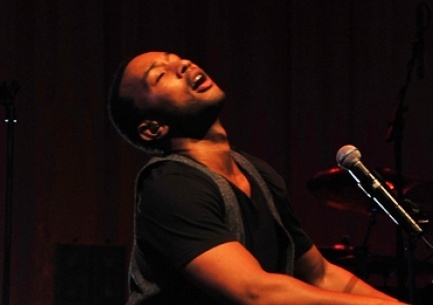 Last night I got to see the phenomenal John Legend in concert. The entire 100 minute concert was a resounding success to all who attended. A big thank you to my hubby who surprised me with tickets for our date night. I love you hunny, you are truly awesome. Labels: Hubby John Legend Love. Thank you so much my Lovelies for stopping by. Swiveling Mounted Chalkboards at Bistro Vida, via here. A vintage carnival wheel and chalkboards are unique accessories to this country kitchen. From here. Chalkboard Recipe Wall, from here. This cafe is pure vintage, dressed with large chalkboards, antique mirrors, huge old school tables with drawers and cardboard packing case seats........source. Chalkboard paint on closet doors is another great kid’s room idea. From here. A stylish home office organizer. A converted panel door into a magnetic chalkboard and salvage the typewriter keys to create 30+ unique magnets. I adore this project from here. A gorgeous flower shop menu saves on paper. What can I say, I love the rustic touch of the weathered door. Via here. Chalkboard tiles are so whimsical from here. Hello my Lovelies. I trust you all a great week and looking forward to the weekend. I know I am, as I have lovely dinner plans with a trip to the beach as well as , to catch some much needed sunshine. Don't get me wrong there is great weather all around me here in the tropics, but when you are working in a cold air conditioning office, you don't see much of the sun or warm weather. I adore simple weekend dresses like the one I've posted, that's breezy and light or shorts with filp flops and a huge beach bag where I just throw my stuff in. The weekend is also not complete without a broad rim hat, the broader the better. Well Cheers to the wekend and be safe my Lovelies, till we meet again. A very happy Christmas and a Prosperous New Year to all my lovelies and to all peace and joy.